Jan 05, 2017: [review] $50 mech from Amazon - my first mech. Also AMA. Jan 28, 2017: Different Type of Same Color Switch? Feb 22, 2017: Individual key color control for E-Element Z-88 RGB LED? Apr 10, 2017: My keyboard isn't accepting my "a" input after a while in Battlefield 1. Apr 16, 2017: Is this a good mech. keyboard for the price of $35? May 17, 2017: Gaming RGB Keyboard? Jun 14, 2017: Just bought a cheap RGB mechboard. 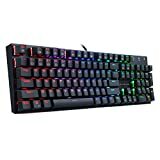 Jul 10, 2017: [help] Cheaper Version of Cooler Master MasterKeys Pro L RGB Full Size? Oct 24, 2017: Which one should I get: E-Element Z-88, AUKEY, or Magicelec? Feb 14, 2018: [help]I want a budget keyboard to test the waters of Mechanical Keyboards. I watched a Linus vid on budget keyboards and one stuck out to me. Is it a safe bet? Feb 10, 2019: Opening Gaming Center, can’t decide!